We have our internet, phone, and cable TV through Charter Communications. Needless to say, we are paying them big bucks each month (and still saving over what we used to pay AT&T). Today we got a flier advertising a new rewards promo where you accumulate points that you can redeem for gifts. For 20,000 points, you can get a $50 AVIS gift card or a $50 Black Angus Steakhouse gift card. Don't want either of those? Well, you're out of luck then - unless --- you visit the Charter Store. The Charter Store is where they go through trucks in the installation department and steal stuff to give away. Check out this fine selection of "rewards". Thanks, Charter! 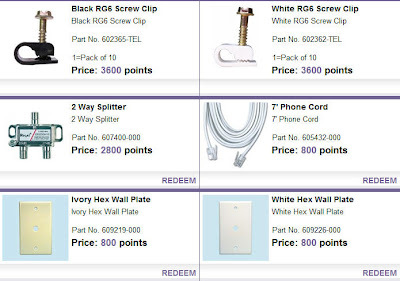 I've got my eye on White RG6 Screw Clip for Christmas!